chicken pot, or someone is frying peach pie, then you know you’re in Georgia. Fill in the form below and we'll send you an email with all our current deals for Georgia. Hey Y’all…It’s Time for a Culinary Getaway Down South Savannah Way! A la Chef's classes are designed to suit the needs of beginners, as well as more advanced cooks looking to strengthen their culinary skills. Private cooking classes are for those who want to entertain and learn at the same time. Chef Carlin will educate, motivate, and inspire you to create memorable meals in your kitchen for your family and friends. Try new cuisines, learn new techniques, have fun! Do you wish you or your daughter/son knew the basics of cooking? I have worked with a local cooking school for years and have trained both adults and children how to master the art of cooking. I provide both individual and group instruction. 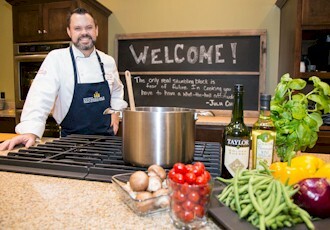 Chef Greg is a certified instructor with Culinary Inspirations, which offers cooking classes in the comfort of your home. A Culinary Inspirations class makes a great gift for any occasion. From Mediterranean to Thai, Malaysian to French, these hands-on classes explore basic cooking principles and skills. Upon leaving, you will be able to recreate these authentic international foods in your own home! Perfect for all skill-levels, from beginners to experienced chefs. Culinary courses for those who want to cook like a pro or simply expand their enjoyment of fine food and beverages. Karen Hilliard, owner and executive chef of Georgia Grille, offers private cooking classes for those who desire to throw on their cowboy boots and give their meals a little kick! Private cooking classes - get a group of friends, church or club members together for a private class, we will do our best to accommodate you on the desired dates and days of the week. In-home one-on-one or group cooking classes. Join friends to make cooking fun! Entertaining for up to 50 people. Rehearsal dinners, retirement parties, birthday parties, anniversary parties, and family reunions. Something new will be cooking this summer, as Savannah Technical College launches its evening culinary arts program beginning with two classes and expanding to a full slate of offerings this fall. The Cook’s Warehouse Cooking School has over 150 classes per quarter taught by guest chefs in four kitchens. If you are in the Atlanta area, do come visit us, take a class, and browse around our stores. The Foodie's Chef is a personal chef service specializing in preparing customized meals right in your home. Other Foodie’s Chef service options include Kid’s Cooking Parties, Cooking Lessons and Pasta Making Workshops. The Hungry Peach is an Atlanta based Personal Chef business that specializes in private parties of 20 and under. We also offer cooking classes, private dinner and luncheons, party planning advice and much more! Join Kyle & Steph as they take you from wood selection all the way to turn-in box preparation. Though there is no cooking involved, the information you receive can help you take your competitive cooking to the next level with a little help from your friends. Young Chefs Academy’s unique sessions are designed to familiarize children ages 3 and older with diverse foods, while they experience what it feels like to create and taste scrumptious recipes themselves! In a charming historic locale, the market offers fruits & vegetables, natural meats, flowers & plants, raw honey and homemade sauces & jellies. Sat. More than just music and fantastic beer - It's about making positive changes in the way each and every person affects our planet. You'll have to come to Vidalia to experience the "whole onion." Promoting strawberry information, providing an avenue for local fund raising and promoting community involvement in a family atmosphere." The best home grown, home made & hand made products this side of Atlanta! Stroll the streets and discover the unique products. First Sat. A celebration of Georgia wine with ten plus wineries from around the state and region bringing some of their favorites to celebrate. An elegant evening of gourmet food and wine. Over 200 beers, featuring the local Atlanta Breweries, and great breweries from all over the country. Great music, great wines, fine art, and delicious cuisine. Five of GA's finest chefs prepare an exclusive & tantalizing five-course dinner with wine perfectly paired by 5 of GA's best sommeliers. Experience the tantalizing aroma & delicious taste of smoke-cooked BBQ, savor every bite of sweet peach desserts, and delight in every moment. Beer. brats, bands and Lederhosen - join the longest running Oktoberfest in the US. Check website for days. Enjoy a week-end filled with Arabic flavors, sights and sounds!